Allied endeavors to represent the best locally and globally. Custom residential work is our specialty. We work with local builders like Princess Homes (featured here), home owners and designers. There are few things more satisfying than knocking a custom job out of the park. We are confident we can achieve the look you want. From Spain to Saskatoon, we've used the best products in the world to design comfortable and livable homes for families of all shapes and sizes. 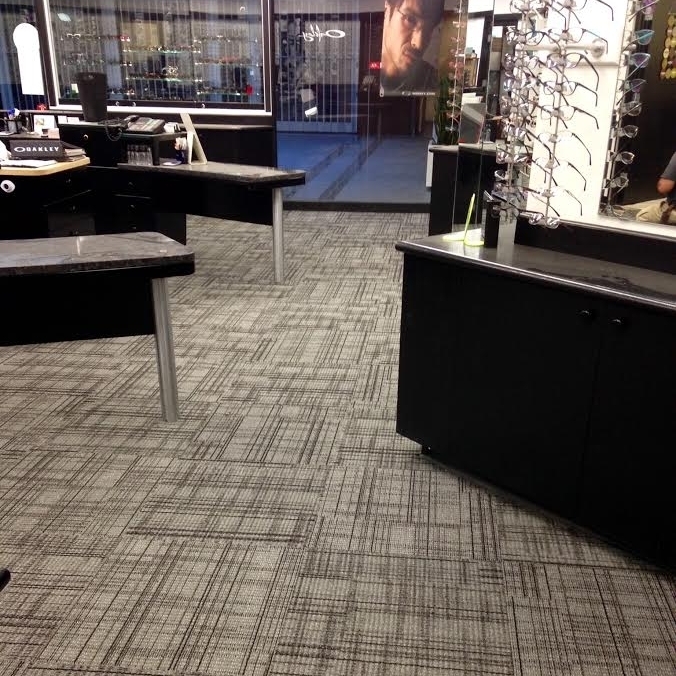 Point optical in Scotia center (featured here) is one example of the custom work we have provided for local businesses. No matter what your commercial needs are, we have the expertiseto get the job done. We have extensive experience with restaurants, offices and shared spaces. We do small locales and bid on large scale projects. 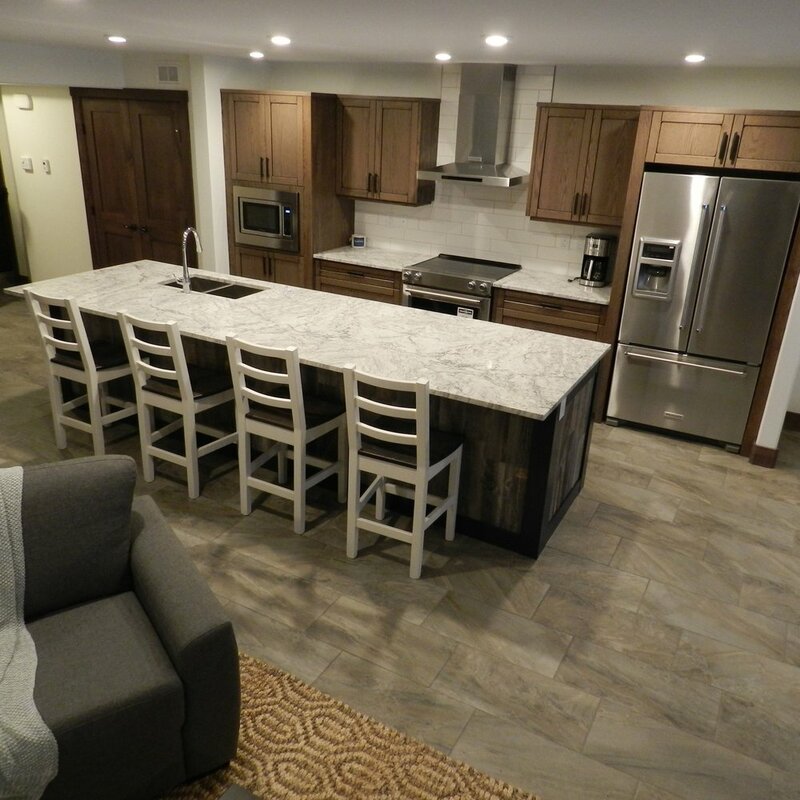 The Lakeview Hotel in Waskesieu, Saskatchewan was a project we completed with Resort Co Properties (featured here). We can provide for the most traditional and the most unconventional looks on the spectrum. For large scale projects like hotels and restaurants, Allied and the Design Firm can deliver. We can help you make a big impact. 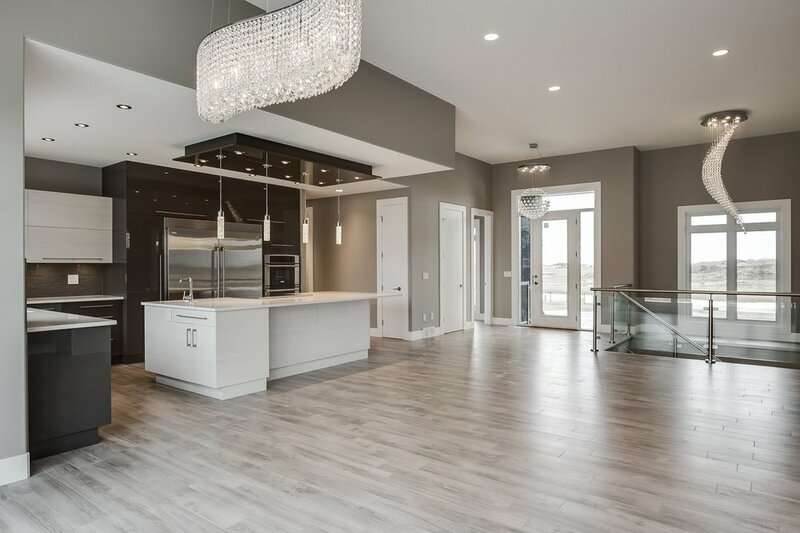 The team at Fisher Homes are true believers in collaborative projects and quality custom work. They know how to take ideas from the conceptual phase to completion with immaculate attention to every detail. These are people that are interested in the knowing the nitty gritty about fashion and performance of every piece that goes into their work and it shows! The back splash in this house ties perfectly into the cabinet and floor choices. It adds some glamour and interest to a minimalist space without making it look feminine. A perfect choice. Tile can often look and feel cold for well-used areas. Which is why a wood look tile is an ideal option! It has a warm, natural look like wood but has the function of tile. Its impenetrable by water and won't scratch or wear as easily. This marble ensuite is a stunner. The workmanship is immaculate and the designer choices work together effortlessly. I love the functionality of tile base in a bathroom, it is easy to clean and looks clean for longer than wood or MDF options. Earthy warmth and attention to detail personify the contemporary french cuisine and the design in this restaurant. Masters of presentation, we worked with Ayden's team to bring a perfect balance of unpretentious style and inspired details. Wood look wall tile is ideal for a restaurant setting. Its a cleaner surface than wood that doesn't change its look over time, while maintaining the earthy suggestion of a wooden surface. The dark color makes the space feel intimate and edgy all at once. At Ayden's we used tones and textures to define separate areas. The kitchen is sharp, white, clean; the dining area is softer, deeper with more undeveloped/rustic textures. The tile along the bar base makes for a practical and beautiful option. Contrasting woods give a rich nod to the natural texture trend. The Porcelanosa group now serves over 140 countries worldwide. They incorporate texture and style from around the planet and bring it to our showroom. 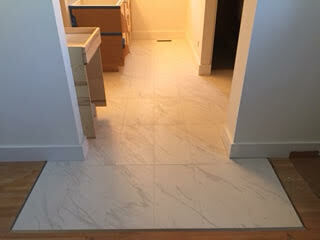 Porcelanosa brought us tile we had never seen: styles unknown to the greater market in Saskatoon. We think you will be pleasantly surprised too. For the University of Saskatchewan's president's residence we were looking for an atmosphere that could transcend trends. It was important to communicate a timeless sophistication. Our projects here began with the entry and fireplaces. The next movement will be a stair runner to complete the look. We will be posting updates. China Black entry tile is a statement with every step. The natural marble is a perfect contrast to the iconic University of Saskatchewan greystone. Marble is a 'forever option' for an institution that will be around for at least a few more years. In recent years, huge efforts have been made to restore the Presidents residence to a timeless look that remains true to the era it was built in. We worked with designer Edie Reikman to re-tile the three main floor fireplaces. All three had different tile that did not coordinate with one another. Now the three work together with the entry. Its elegant and simple. Its the small things, the custom details, that make the biggest difference when making a house a home. We partner with top local builders, designers and contractors to bring our customer's houses feel personalized. We offer the advice to make your dreams reality. With a designer on staff, we can give advice that will make your house look like home. Sometimes every piece can come together in perfect harmony. Its not always about the amount of money spent but the love put into a space that completes a look. Point Optical in Scotia Center, Saskatoon is a vision of simplicity and clarity. Simple lines and neutral colors are contrasted by the contemporary textures and shapes. We wanted to contribute to the overall feel of Scotia Center with our product: timeless yet contemporary, a blank slate. An eye catching mosaic is a great way to bring customers in. Interior design can communicate a lot about your business. We wanted to show something interesting, clean and contemporary to highlight this business. We wanted to combine function and fashion with an eye catching glossy hex entry. Carpet tile is a great option for commercial spaces, its quiet, quick to install and really easy to replace portions that get worn. Tower 21 is a central hub for commerce downtown and has the foot traffic prove it. They needed products that were contemporary yet classic and built to last. Carpet tile, graffiti resistant tile and porcelain. This is some masterful tile work. It is hard enough to do work above your head, but to complete this job on a curve with this kind of precision is applause-worthy. Tower 21 was a giant undertaking for details like this. A large format marble-look porcelain is fresh and modern. The walls of this entry are covered in a graffiti resistant tile. The outside of the building has this too. Milliken's color field carpet tile is a staff favorite for good reason. Its uber-durable and has such a fun color pallet. We knew this would be a perfect fir for the Obassa team.